Preheat your oven to 400º and place a rack in the upper third of your oven. In a medium skillet over medium heat, add the diced bacon and cook until a good amount of fat has been rendered out, about 1 tablespoon or so. Add the diced onion and the garlic and cook until the onion is translucent and the bacon is crispy. Remove from the heat and cool slightly. Combine the ground chicken, egg yolk, 1 tablespoon of tomato sauce, parsley and the bacon, onion and garlic in a large bowl. Season with salt and pepper and mix well. Form meatballs and roll into little balls, about 1 tablespoon of mixture per ball. 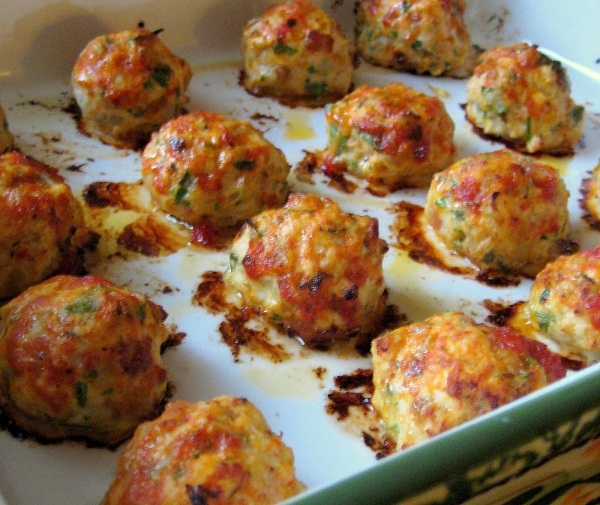 Place the formed meatballs into a large baking dish about one inch apart. Combine 1 tablespoon of olive oil and 1 tablespoon of tomato sauce together in a small bowl and brush on top of each meatball. Pop into your preheated oven, and bake for 15 minutes.